We had our last up-close view of the pyramids a few days ago. These pictures were taken during the "Sound and Light" show which runs every night after sunset. 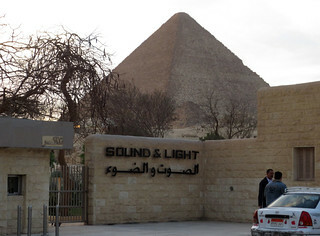 The entrance to the show is here near the Sphinx entrance to the Pyramids. But we usually watch from a nearby friend's home. The show is a bit hokey, especially the sound part. But it is worth attending at least once. 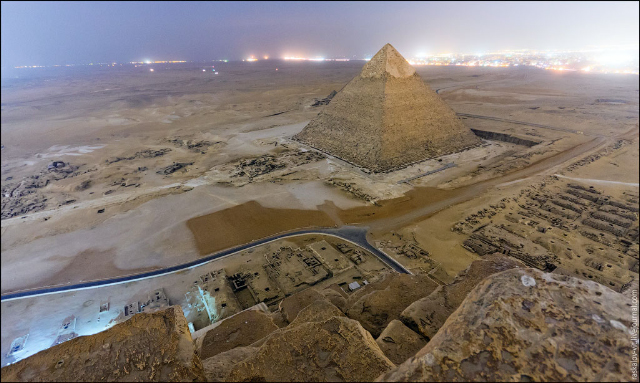 You may have read of the several Russians who illegally climbed to the top of the Great Pyramid and took photos a few days ago. 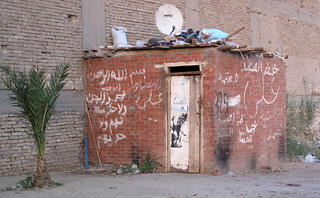 Remember, this is Egypt. Everything is for sale for a price. The pictures they got are fabulous. If you haven't visited their website, here is the link. 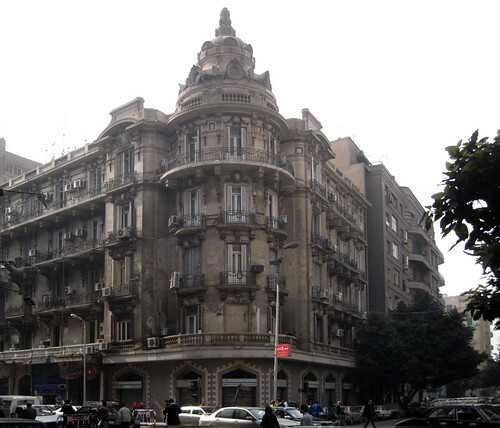 And with that population chart from Part 3 in mind, let's take a look at some of the buildings that were standing back in the time when Cairo's population and infrastructure were a good match. 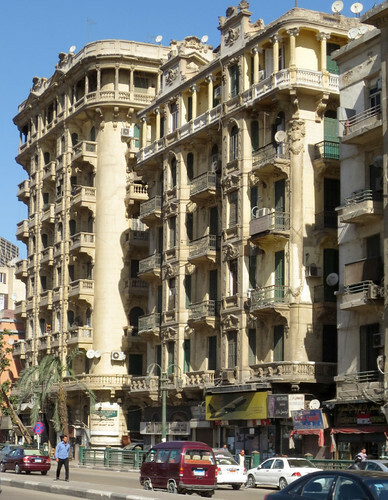 Walking through downtown or Islamic Cairo, you catch a glimpse, occasionally, of a building and just stop to look. What a city this must have been in the 1950s and before. Let's start a mile or so from the pyramids. 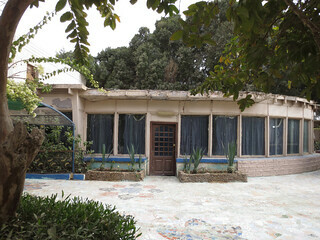 This old house came into view as we approached the Ring Road from our outing to Kerdassa. This was once a family residence. A friend recalls it from the 1960s before any highway came very close. Just crop the junk and the freeway out and take a closer look. 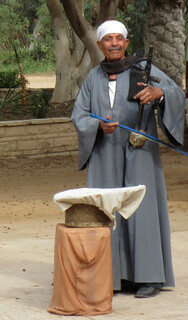 Walking through Islamic Cairo we came upon this gem when walking with first time visitors Aliza and Alan. Then there are the classic downtown buildings. At various times residences or hotels, these are buildings that show up in the pictures by Lehnert and Landrock. 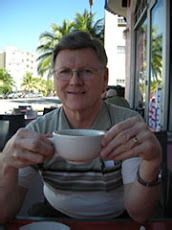 Follow this link for a grand tour from the 1920s. 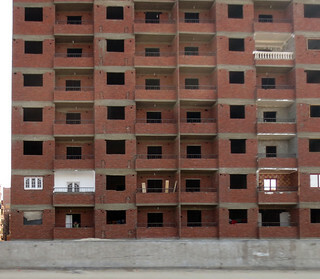 Frenzied real-estate speculation has continued to drive development on Cairo's outskirts: houses and apartments in the new cities are sold and resold many times over before they're even built. My salesman, it turns out, lives in another new development called Dreamland, but he also bought an apartment in Madinaty "as an investment"; in the few years since his purchase, it has already doubled in value. So many people have purchased "investment" properties that, in a city with a severe housing shortage, an estimated million apartments sit empty. ... entire new areas have developed in recent years in a process of real estate speculation that has produced millions of uninhabited square meters of residential space in the interstitial spaces between the core city and desert extensions. And that is the most striking aspect of the housing market. Consider these pictures. I don't think that estimate of a million empty apartments is any exaggeration. The article was published in March of 2010 and the numbers have only increased in the past two years. If you held Egyptian Pounds, you'd be scrambling to get into real assets too. ... massive swaths of self-built districts on previously agricultural land largely rely on infrastructure that was not designed for dense urban areas. Immediate intervention and upgrading is necessary in such areas to provide not only better access to drinking water and sewage but also appropriate services such as health and educational facilities. 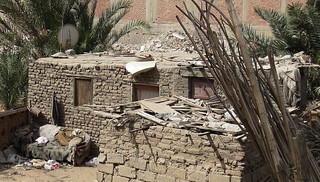 In short, the task of confronting Egypt’s and Cairo infrastructural challenge is pressing and difficult, but it also presents opportunities for development, employment, skill-training, and overall improvement of quality of life. Improving streets and sidewalks, long neglected by the state and international donors, is a basic infrastructural project that would have a universally positive impact on urban life. Wait a second. "Improving streets and sidewalks?" Yes, they are bad. But you can tell this is an academic writer. The electricity is going out frequently. Diesel fuel is in short supply - the New York Times reports gunfights over diesel (I can't find any reference to that locally, though) and the author of this article sees sidewalk improvements as having a positive impact? I think he needs to interview a few shop owners and tourism operators. Perhaps the real problem is an inability to prioritize. But the critical problem is population growth. This article puts the Egyptian population at 91 million - a remarkable increase of 18% from six years previously. 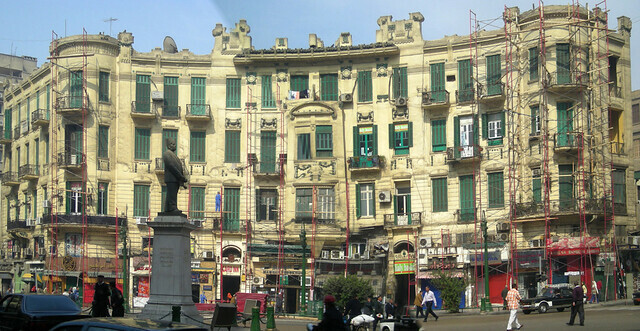 Wikipedia puts the population of Cairo at around 18 million. A two year old article in the independent tosses out a 20 million number. I found this chart in an academic paper. The problems of a young, growing underemployed population may only be beginning. 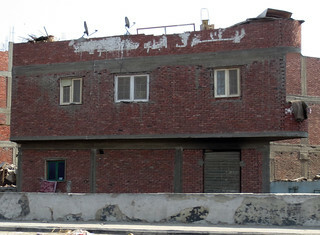 I started gathering pictures for this series of blog posts when I read this news article about Cairo housing. I was struck by a couple of paragraphs. 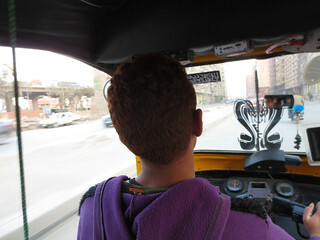 To drive Cairo's Ring Road - a 110-kilometre freeway that loops the city - is to sail through an endless sea of red brick. 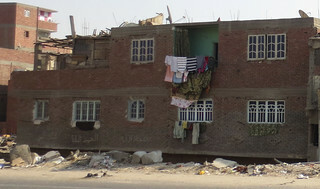 The brilliant green of the Nile Valley appears only in flashes through the expanse of cheap apartment blocks. The buildings occupy what were once agricultural parcels; like those parcels, they are long and narrow, with only a hair's breadth of space between them. They crowd right up to the freeway, so close that motorists may glance directly into their bare rooms. From their rooftops sprout unfinished supporting columns - ready for the addition of yet another floor. Their only decoration is bright, mismatched shutters; balconies enlivened by bold geometric patterns - pink and purple lozenges, green and orange stripes; and the bricks that spell, along the upper floors: "Allah." 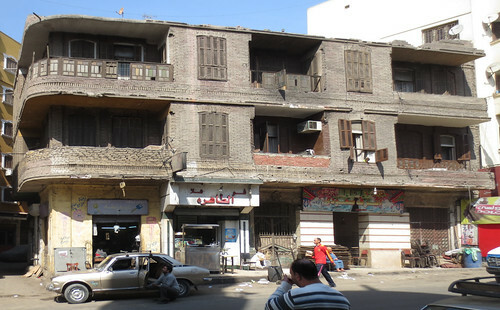 These are Cairo's slums, what experts call its "informal" or "spontaneous" neighbourhoods. 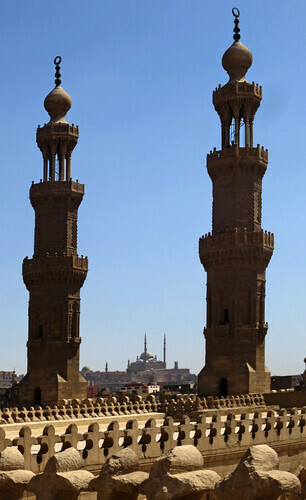 Egyptians call them ashwa'iyat - from the Arabic word for "random", "haphazard". 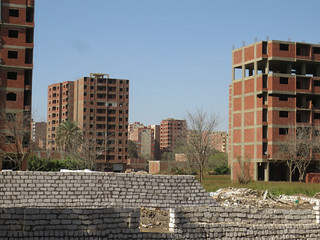 They are the dense, sprawling answer to Cairo's population explosion and its lack of affordable housing. Almost six in 10 Cairenes - at least 10 million people - live in informal neighbourhoods, often with limited access to water, electricity, schools, hospitals or refuse collection, and no real roads. A harsh description but no doubt accurate in many cases. But, read the whole thing. It illuminates the chaos of the housing market here. Here are a couple of illustrations collected from along the Ring Road. I've learned, though, not to judge a book by its cover. 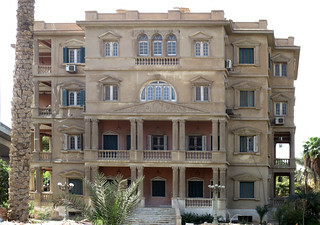 Whether it's a brick building next to the highway in Cairo or a a dull grey apartment block in Russia (known by the locals as a "Khrushchev") the inside might be quite elegant in comparison to the exterior. Exterior appointments are simply not a priority in many areas of the world. Curb appeal? There are no curbs either. Some exterior stucco and paint and these could look pretty nice - but where else might you spend the money. ... there is virtually no traffic noise. The abundant greenery bears little resemblance to most of the crowded areas seen in urban Cairo, and belies Maadi's desert location. Well, that certainly doesn't describe our neighborhood. Another place people think we might live is in one of the newer "satellite cities" like 6th October City. 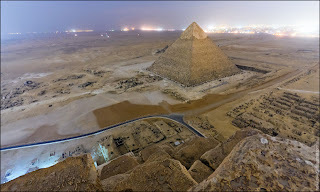 This is a spot about ten or fifteen miles away from the pyramids. Driving past it, the billboards beckon toward a very uncommon lifestyle. Homes there go for perhaps ten times the price of a typical middle-class home and rival the desert homes in Phoenix or even Palm Springs. Yes, they are large, upscale, and behind gates. Some even have swimming pools. We had the opportunity to visit one of these gated communities and the homes are indeed elegant. Many are also, from what I could see, largely vacant. This is a common thread you will see in the next couple of posts. There are even regulations that require the windows to be of uniform variety and no, you can't paint yours purple. Quite a contrast to real life in Egypt. What Does it Cost? - The Tourist Restaurant. 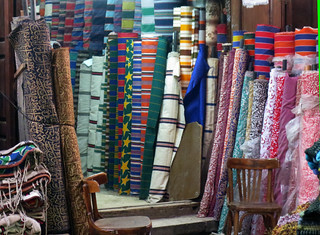 The price of anything in Egypt is flexible. If he says "two hundred," I'll say "twenty," almost automatically. Next, we negotiate. We might settle on one hundred. If I really didn't want it, and I am responding "twenty one," then "twenty two," I am sometimes surprised to hear, "OK, thirty." I know, I shouldn't have started negotiating in the first place. But it's so much fun! 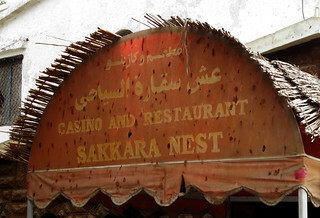 When we visited the Dashour pyramids a few weeks ago, we were hungry on the way home along the Sakkara road. We suggested to our driving friend that he stop someplace nice for lunch. We spotted a place on the other side of the canal and had him swing over. It had a pretty entrance with lots of plants and landscaping. Upon closer inspection, we could see that maintenance had been a bit neglected. But there was a busload of European tourists there and a couple of cars with small parties so, why not give it a try? We were going to sit outside in the garden anyway. There was no menu, but the standard fare sounded fine. 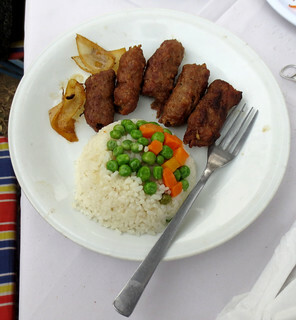 The usual salads, pickles, kofta, rice and vegetables etc. The musician only played as people passed by him. When I asked for the bill, it came to 240 pounds. About $36. That's pretty high. We had dined in a fancy restaurant in the Khan the previous evening for a bit less per person. OK, no menu, no prices, my bad. As we left and drove the wrong way on the street through heavy traffic for a few hundred yards, our friend said, "how much did it cost?" I said, "two fourty." He handed me a wad of bills and said "count it." "One twenty," I announced. Our friend explained. "The man said 50-50" and gave me this as we left. "I tried to tell him at the start that these weren't tourists, but he did it anyway." We asked around later and determined that a 50-50 split is not unusual for a guide at a tourist restaurant. 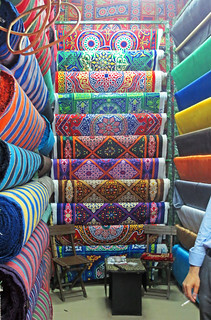 Some tour operators now insist on a 65% cut at souvenir shops. It's a tour operator's market. Merchants will adjust their prices accordingly. A lone amateur guide such as you might pick up at the Khan will usually get 15-25% on carpet, boxes, alabaster and the like. Everybody gets something for bringing business to a shop. It's how business is done here. The same applies to government transactions made in a timely fashion, by the way. Do you suppose that "social dialogue" is going to address all the cash-off-the-top transactions that take place? And that 145th place finish in tax efficiency is only on the official numbers after all the "commissions." Mass transit has to actually work here so it consists of several very efficient layers. Yes there is an actual subway system that operates two lines very efficiently near downtown. Fares are about fifteen cents and at rush hour the cars are packed Manhattan-style. (Map here. A YouTube video here.) This promotes a lot of unwanted touching which is dealt with by providing a separate women's car at the front of the train. Don't get on it with your wife by mistake, guys, there will be lots of yelling! 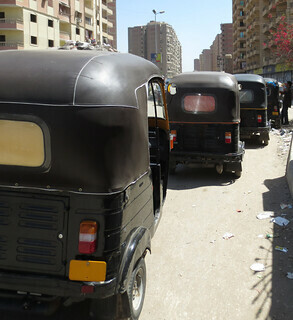 Your trip from downtown will end at a station where you will meet the microbus. This is where the mass transit system becomes both interesting and efficient. Every station will have a multitude of these small microbuses ready to take you on the next leg of your trip. They are rugged and small enough to get into any neighborhood. I haven't actually ridden in one since you need to be able to both shout out your destination and be able to deal with the response in Arabic. You will find them in clusters at stations or just moving up and down every decent sized street. But the real marvel of the mass transit system is the solution to the "last mile" problem. 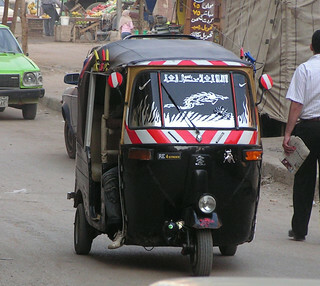 The three-wheeled Tuk-Tuk, imported from India and "manned" by a 14 year-old driver will take you from the bus stop to your front door. 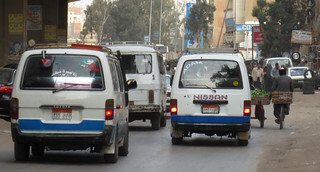 These vehicles congregate at large intersection which serve as interchanges with the microbuses. They aren't all driven by 14 year-olds. Many drivers are older. Quite a few make me wonder how closely that 14 year-old minimum is watched. They aren't supposed to go "out of the neighborhood," but like all laws here, that doesn't seem to be enforced. They have some of the best sound systems installed anywhere on earth. Boom-thumpa-thumpa. Here are views from the passenger seat and of a tooth-gritting passenger as we zip home from the local supermarket with driver, Ali. Now this is mass transit that I could get behind. I picture myself back in Bloomington, leaving the mall on a microbus. 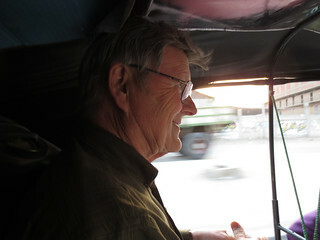 I would be met at the entrance to our neighborhood by a teenager with his Tuk-Tuk and driven the last half mile to our house. Later I might phone the driver to take me up to Lunds to pick out some fresh vegetables. All that prevents this efficiency back home is a little regulation, bureaucracy and taxi-driver union opposition. 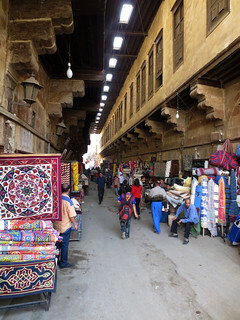 Since we had visited the Street of the Tentmakers last Sunday and found most of the shops closed, we returned today for another look during daylight hours. 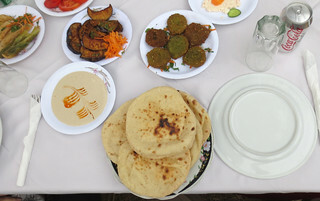 We started out with a late breakfast at Khan El-Khalili. Once again, we didn't see many tourists but the ones who were there were very happy and taking lots of pictures. I always enjoy photographing other photographers. Part of the charm of the Khan is the narrow streets. I wouldn't have believed that a large bus could fit down this street, much less make the tight turn onto the street. But it happened. 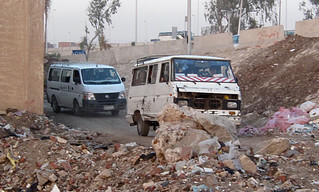 Always watch for what's coming behind you and in front of you in Cairo. 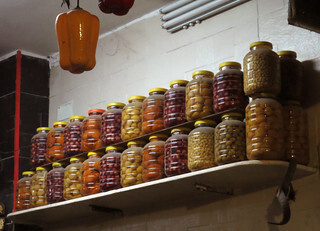 We crossed over Al-Azhar street to stop by the "pickle factory" during daylight hours. 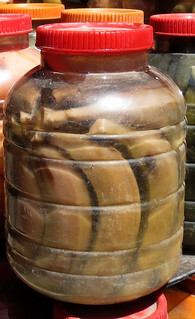 Yes, those were pickled bananas that we had seen the last time we were there. I had a pickled lemon at dinner yesterday but don't know if I want to try a banana. 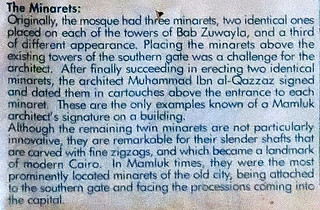 When we reached Bab Zuwayla, I got a couple more pictures of the gate/mosque minarets. The Street of the Tentmakers was much more lively than before. The shops were all open, although there were few tourists. The colors inside the shops were bright and cheery. 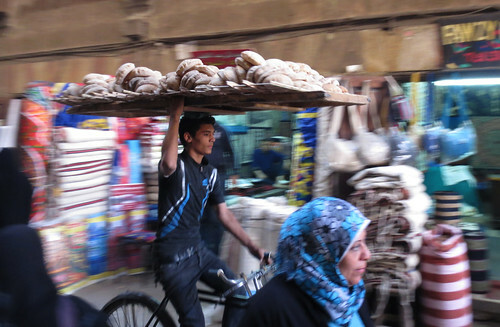 And I always seem to get my best pictures of bread in motion here. Pickles? Yes. Here the word doesn't refer to cucumbers but to pickled vegetables. 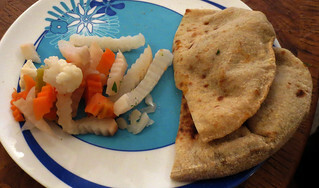 The usual pickles are carrots and turnips but you might also find cauliflower and others in the assortment. Pickled cucumbers are rare, though. By the way, they are very tasty. I have often wondered where the pickles come from. Every little sandwich stand has them. Restaurants usually offer them for free or close to free. 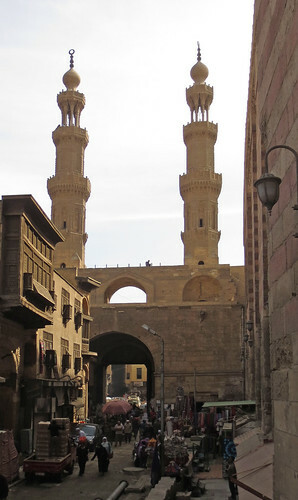 When we finished our expedition to the Street of the Tentmakers last week, we headed back toward Al Azhar and Khan Al-Khalili. 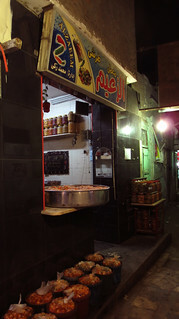 "Alex" knew a fatir restaurant (think Egyptian pizza) nearby. 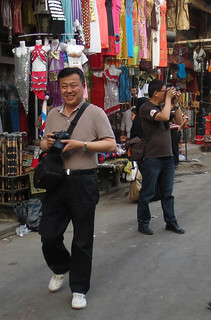 We followed him down several narrow back alleys. Then, we passed by this shop. 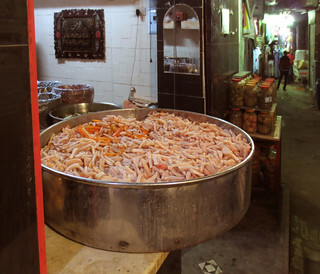 I spotted the huge vat of pickles immediately. And many jars. It turns out that this is a well-known pickle-maker. 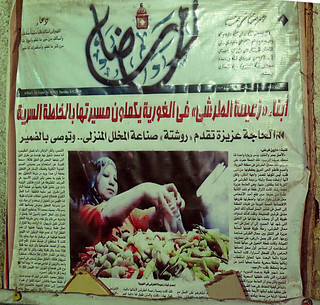 This newspaper article from Al-Masry Al-Youm from 2009 tells the story. It is displayed on the wall opposite the shop. Just after we left the pickle shop, the lights went out. Not just the shop lights - every light. Well, that's a new experience! It was dark. Don't move. Remember those holes in the road that I have shown before? But this too, is "normal." Everyone seems to carry a flashlight app on their smartphone and soon small lights began appearing around us. We moved cautiously for about three blocks. I noticed that in one coffee/shisha shop, the backgammon players had lit a candle and continued their game. 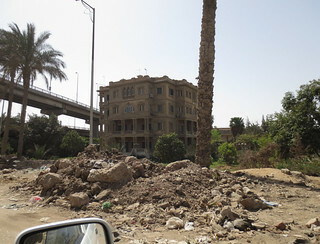 Once we reached Al-Azhar street, the lights were back on on the Khan side of the street. We thanked Alex and had our fatir dinner in the Khan. It's Watermelon Season in Egypt! Just How Popular Is the Egyptian Government? Look Up, Look Down. Look Out! How are Things Going in Tahrir Square?